From the depraved minds of Troma, comes the first feature film directed by Drew Rosas. 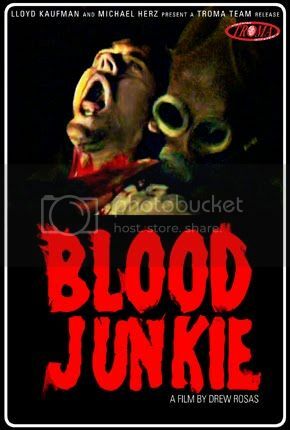 Blood Junkie is a an 80's horror film...except it was made last year! Everything from the cinematography, music, mustaches and basically every other aspect screams 80's. I happen to love 80's horror films so I was excited to see how the film held up against the films of that era. Made for the paltry sum of $7,000 in Wisconsin, I would say that the odds were against it....or were they? Blood Junkie follows Craig (Nick Sommer) and Teddy (Mike Johnson), two teenage dorks with surprisingly thick mustaches for their age. While hanging out at the local liquor store, they spot Laura (Sarah Luther) and Rachel (Emily Treolo), two underage girls using their charm to score some booze for the weekend. Craig and Teddy use their charm (or more likely unseen hypnotism) to coax the girls to go camping with them for the weekend. Despite the fact Laura has to drag her little brother along, they agree. While in the woods, Teddy tells the others a story about a worker at a local chemical plant who, after an explosion, was badly burned and his body never found. The man supposedly killed off all of the livestock in the area and drained the blood from the animals. The group stumble upon an abandoned building that just might be that chemical plant in Teddy's story. Only problem is that Teddy's story might not just be a legend. Blood Junkie is one of the most authentic (and enjoyable) 80's style horror films to come along since...well... the 80's! It is obvious that the film makers love the genre and took a lot of time to make the movie feel like it was filmed 25 years ago. Everything from the cheesy synthesizer soundtrack to the horribly dated wardrobes (and hairstyles) make Blood Junkie a hilarious trip down memory lane. The homages are obviously tongue-in-cheek but the film also succeeds in the horror department, featuring a deformed maniac with a strange fetish for the red stuff. Throw in some nicely done makeup FX, so-bad-it's-good dialogue and a great ending, and you have yourself a nice little gem. I would gladly take Blood Junkie over all of the crappy, dime-a-dozen, horror remakes being churned out today...and I bet most other horror fans would too!